Missing families! Kids with superpowers! Mystical beings arriving in El Paso! Who or what has been behind the strange doings in Jaime Reyes' hometown is about to be revealed. 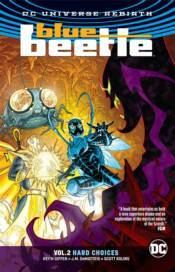 It's a force so powerful that Doctor Fate has no choice but to team up with Blue Beetle-even though he still suspects that the Beetle might have some connection to the evil entity they must battle. Collects issues #6-12.